Crap! Things have gotten away from me: here’s a workbench snapshot. I’ve actually been somewhat productive over the past few weeks: I just need to clear off the table, set up the lightbox, and take some pics. In the meantime, here’s what I’ve got half done. That’s a Bones gesso-priming proof-of-concept (which was immediately determined a success, other minis were painted, and I just need to circle back and wrap it up), the last few archers before I can run my Normans fully painted, a Battlefleet Gothic cruiser for the Rogue Trader game I’m planning, and Michael Paradoffsky von Thorn; a By Fire & Sword fig I got with the book (I backed their Kickstarter, but didn’t buy any figs; I’m really rethinking that, and want to paint a model in 15mm first). 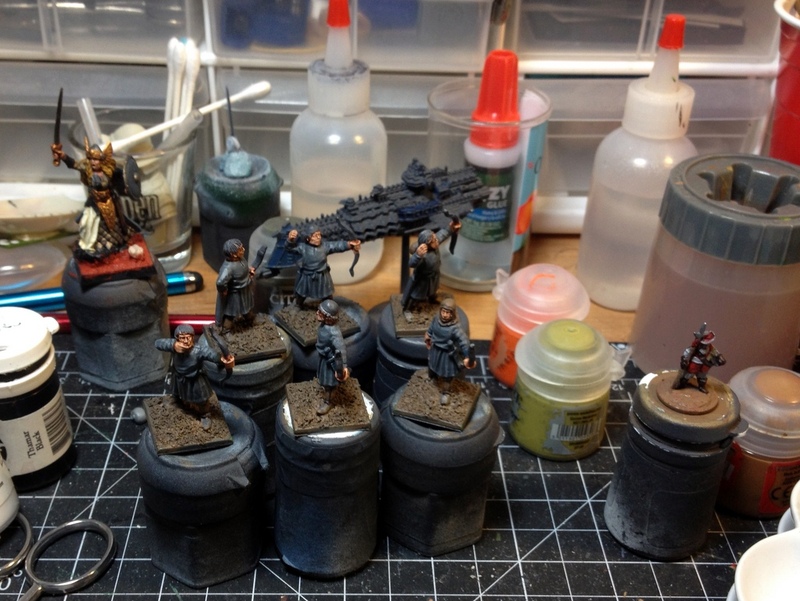 This entry was posted in Warpstone Pile and tagged hobby on 2013-11-20 by Rushputin.